Knowing how important wellness in the workplace is to a company's overall success, I have put together some of the finest workshops and seminars for workplace wellness that produce remarkable results. You can choose from the seminars below, we offer a large selection of corporate retreats and corporate training programs geared towards workplace wellness and your company's continued growth. Speak with me, Eileen Lichtenstein, Corporate Life Coach about customizing a specific program that will suit your companies' needs. info@balanceandpower.com or (516) 623-4353. On behalf of the Brookhaven Town Division of Women's Services, I would like to thank you for helping to make this year's Conference and Expo "Women Empowering Women" Work, Health, Family a great success, Your Workshop really captivated our audience to give them power within to be positive and make changes in their lives. Value-Based Living: This seminar will generate lively discussion and bring value based concepts for peaceful living into the forefront. The content is based on an international curriculum www.livingvalues.net and is especially targeted to parents, educators and students. Sensitivity Training helps people become more aware of their own prejudices, and helps them become more sensitive to others. Sensitivity training, also known as diversity training, is a type of program designed to help facilitate respect between groups that include people with different genders, religions, ages, races, or sexual orientations. Sensitivity training workshops involve lectures, discussions, and exercises to help those involved understand and respect one another. Sensitivity training can be implemented in workplace, educational, senior and healthcare environments. 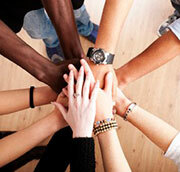 Each program is customized and addresses the unique needs of the populations of the group. The program may be designed specifically for employees, administators, caregivers, seniors, patients, parents, students. 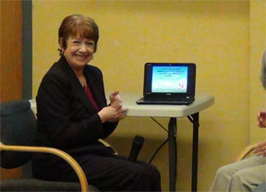 ***Trainings for staff dealing with the elderly or in healthcare facilities include building tolerance of memory loss, lonliness, depression and anxiety among clients, residents and patients. 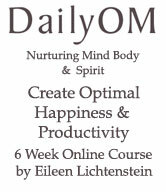 Join Eileen's New Course at Master Mind University! "It is only through gratitude that life becomes rich." (631)-494-4421 - Get Connected with Eileen Today! Learn How To Become A Successful Entrepreneur Using Knowledge & Wisdom at MMU! Balance & Power, Inc. has been addressing stress and anger management issues for two decades, corporately and in the educational and private sectors, and is now facilitating Workplace Bullying Prevention trainings. Bullying in the workplace has reached epidemic proportions - it is our goal to help eliminate these type of situations. Eileen Lichtenstein, CEO, believes inner strength and being centered are keys to optimal productivity and happiness. She is a Certified Anger Management Specialist, accepted by the US courts, a former Biofeedback Practitioner, and former faculty member at Hofstra University. Would you like this workshop in your venue? In addition to EFT, you will learn about healthy food choices, and more from a registered dietician and health coach. The interactive experiences were quite effective and the inspirational and practical strategies that you shared will surely help the student to be successful in college and beyond. We look forward to working with you in future semesters!" 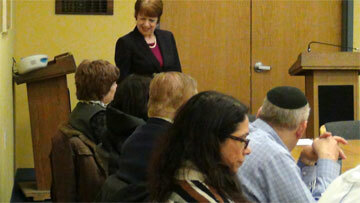 "Eileen's Presentation was very engaging and well received by all. We are living in an economic climate full of stress and endless things to do. Most people do not take the time out of their busy schedules to relax, balance and effectively manage the stress in their lives. Your program is highly recommended for all to become a well-rounded, balanced person." "Eileen - Thank you for a wonderful workshop! I think everyone left ready to focus, avoid procrastinating and have confidence". Learn about the incredible benefits of the Emotional Freedom Technique, how to maximize your potential and create health, happiness and success in all areas of your life. EFT releases the blocks that prevent you from achieving your goals. Through tapping on acupressure points you can lose weight, reduce stress, release fears, anxiety phobias and physical and emotional pain. Gently tap away the blocks that prevent you from achieving your goals. What's next? Explore options and career transition opportunities in the retirement years, including starting your own business, creating a non profit, volunteer opportunities, hobbies, travel and more! 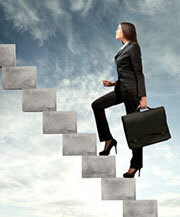 Create personal goals and an action plan for the next exciting phase in your life! The Sandwich Generation, Baby Boomers Being There for Everyone While Staying Sane! Issues and problems unique to caregivers for parents while being an active and loving parent are explored. This is also a forum to share resources and wins. Come away with a personal goals and an action plan for navigating this difficult territory! Corporate Retreats, Corporate Training, Wellness in the Workplace and Conference organization/facilitation within corporate, non-profit and educational settings. Contact us for details! info@balanceandpower.com or (516) 623-4353. Our organizational and corporate training align individual development and organizational competency with business strategy to create wellness in the workplace. Discover how others perceive you and how to communicate clearly, confidently and consistently. Understand the aspects of dynamic teams and how to handle stars and underperformers. Learn how to keep team members engaged, promote good decision making, and maintain consistently strong performance. Understand the difference between leading and managing and how to do both. Learn the principles of dynamic leadership for change and how to motivate yourself and others. Eileen Lichtenstein, Corporate Life Coach and CEO of Balance and Power works with teams of coaches and trainers to drive performance, engagement and affiliation through the entire climate of an organization. We offer personal, one on one executive, team coaching-training and open enrollment on site, via telephone and in numerous locations throughout the New York Metropolitan area. a customized package to meet your needs and budget.